Where there is a gathering of people, Stone & Wood will be the beer in their hands. That’s the vision of the brewery’s founders, and the driving force behind their recent expansion with a new production facility. Until now, Stone & Wood Brewing Company has been unable to fully realise their ambitious vision. 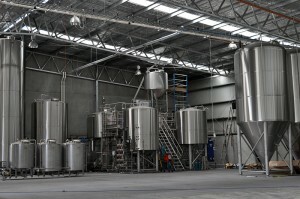 The size of their Byron Bay brewery could not meet the huge demand for their popular Pacific Ale. They made a commitment to always have a supply kegged beer for their loyal draught customers, but that meant that the nation-wide supply of Stone & Wood beer in bottles ran almost dry. Around Christmas 2012, the fast growing business was at an impasse. Bars and stockists were knocking down their door, wanting more Pacific Ale, while other beers like Jasper Ale and the Lager lost production space to the Pacific Ale juggernaut. They realised that Stone & Wood needed to expand their production ability, significantly. The cramped old brewery in Byron Bay. The options were considered, and their business stance was cemented: no one else would make Stone & Wood beer. Contract brewing was out, and their current site in Byron Bay could only fit so much. The hunt began for more space, and a solution was found in mid 2013. That solution was recently showcased in true Stone & Wood style, by way of a gathering. On this occasion it was a group of beer related trade and media, invited along for the annual Stone & Wood Stone Beer Brew Day and a tour of their new brewing facility. I was invited along on behalf of Australian Brews News, for the opportunity see inside the Stone & Wood operation circa 2014; hear about their past, present and future; and ask the Stone & Wood crew anything. And at all times, this gathering of beer people would have a Stone & Wood beer in our hands. It began with a walk through Stone & Wood’s original brewery, a glorified shed at Byron Bay, where the company was born in 2008. The now crammed space is dominated by fermenter tanks, both inside and outside. Soon, the large shed will be restored to the spacious setup of their early days, as most of the larger tanks are relocated to the new facility. The original brewhouse will remain at Byron, and the space will be renovated to include a tasting bar, providing a cellar door style operation, which Stone & Wood has lacked to date. From Byron, the gathering was bussed through the hilly northern rivers region of New South Wales, to where Stone & Wood is growing up. 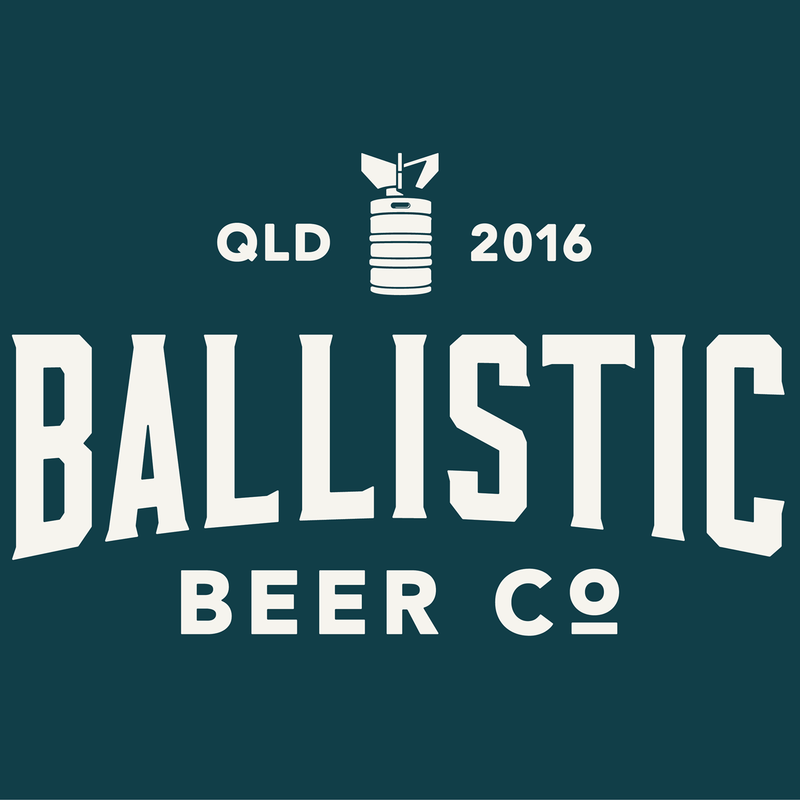 Located in a sparsely populated industrial zone of Murwillumbah South, their new brewing site is enormous compared to their original home in Byron Bay. Plenty of space to grow for Stone & Wood at Murwillumbah. The building was formally a purpose built Bunnings Trade Centre that was occupied for only a short time. Stone & Wood currently hold a sub-lease with Bunnings, which will revert to a lease with the property owner at its conclusion. “The owner is very happy for us to have a long term lease here. 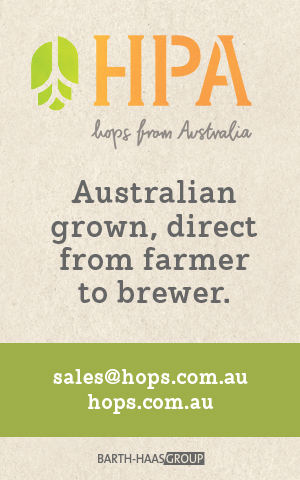 It provides long term security for a business like us to be here,” noted head brewer Brad Rogers. The site’s isolation from urban infrastructure means that there is no reticulated gas available. Therefore, they now have to bring in and store their own gas supply, and they also needed to build their own trade waste facility on site. 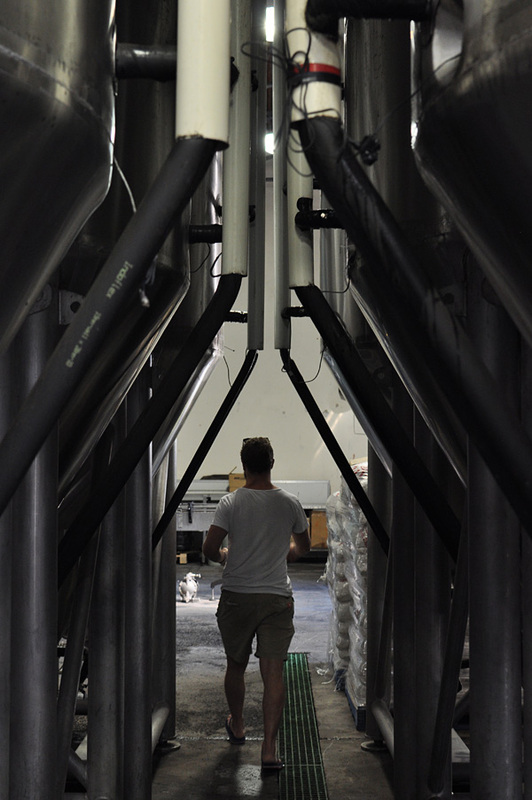 Most of the brewery setup at Murwillumbah mirrors the Stone & Wood setup at Byron Bay, just at a larger scale, allowing an easy transition for their existing staff. However, the huge space allows for a couple of additional luxuries, such as large silos to store all their pale malt grain, reducing the need to carry and open individual bags of malt. The heart of the facility is a shiny new 5000 litre (50 hectolitre) brewhouse manufactured by Canada’s DME Brewing Systems. 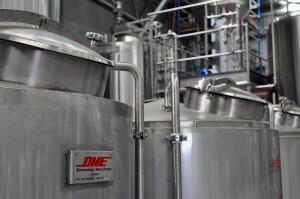 The new DME tanks at Murwillumbah. Ross Jurisich explained that the 5000 litre size is part of carefully staged growth. “A lot of people have asked, why haven’t you gone to a 100 hec or 150 hec Brewhouse? But to go from 50 to 100, it’s not just twice the price. 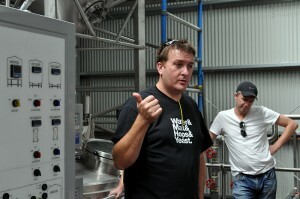 Once you get to that size, you’re talking four to six times the price [of a 50 hec Brewhouse]”, said Ross. “At that point, everything gets scaled up,” Brad clarified. The new site has also opened up the opportunity to include numerous sustainable initiatives, primarily due to the massive roof covering the building, perfect for collecting rainwater and solar energy. Brad Rogers talks about the new brewery. “We’ve employed Tom [O’Rielly] as a sustainability manager. Tom will play a pivotal role with us going forward with some sustainable practises that we’d like to investigate,” said Brad. The tour concluded with a walk through the packaging area, where a new bottling line is being commissioned. We saw that the Stone & Wood bottle labels, which used to read “Brewed in Byron Bay”, now say “Brewed in the Northern Rivers”, with other packaging also baring the new slogan: “Born and raised in Byron Bay”. 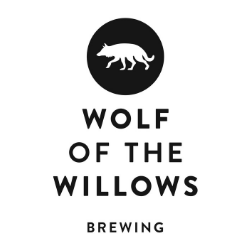 It’s a slogan that will appear across all of their new branding and merchandise, reflected the brewery’s change of production location. The return trip from Murwillumbah to Byron Bay included several stops at local pubs along the way. It was a subtle statement that this is Stone & Wood country. Filling the beer glasses of the local communities is the brewing company’s first priority. 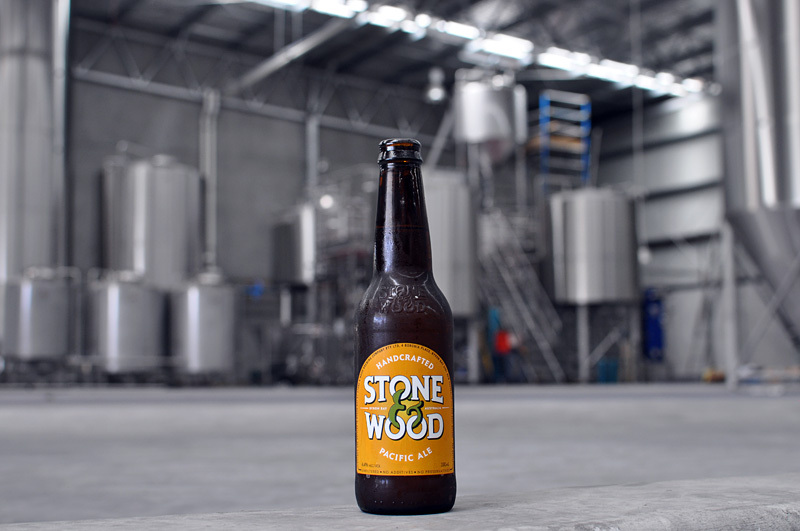 Stone & Wood’s main brewery may no longer be in Byron Bay, but through a network of beer-lines, their roots clearly stretch from their birthplace at the east most point of Australia’s coast to their new house in Murwillumbah. The original site in Byron will remain their “global headquarters” and now be dedicated to brewing seasonal releases like Stone Beer and their Mash Collective collaborations with artists and other non-brewing communities. It will also help them keep up with the demand for Pacific Ale during the peak months of December and January. “And there will be good coffee” remarked Jamie, Ross and Brad on different occasions, as they outlined their plans for the tasting bar at the original brewery. Production at Murwillumbah beings this month. 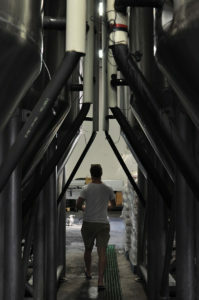 For more pictures from the Stone & Wood new brewery tour, visit the Brews News Facebook page. Congratulations on the new Brewey . Would love to be part of design team for the hospitality area. I was Design Creative for the hospitality offering in Geelong for Little Creatures, I I am a big fan of craft beer, and the use of recycled materiels in my interiors. Having visited the S&W Byron Brewery in June, 2013, and seeing the growing popularity of the range of their beers interstate, it is hugely exciting to see this expansion being achieved. I hope this means we get to see more Jasper Ale and Stone Beer south of the border. The new site looks like it offers heaps of room to grow. This also means creating more jobs in the Murwillumbah area. Tops!